My daughters are going to be hosting a stand on Flavourites, a fair for internetshops. My daughter Anke is a graphic designer, and will show her products at that fair, my other daughter will help her. Their booth is next to the entrance of the hall, and the event will take place at the end of november. 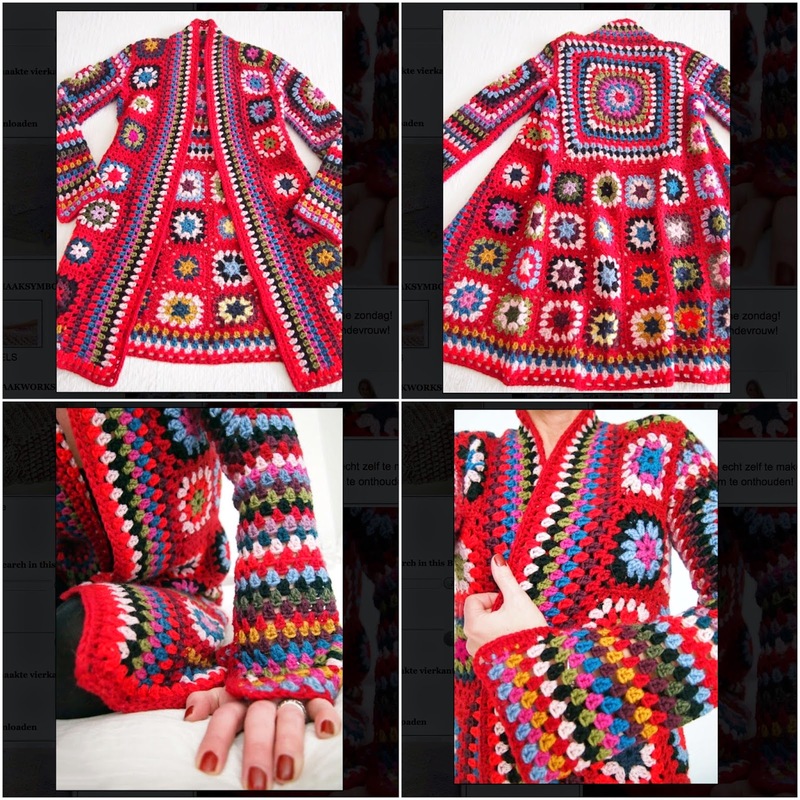 On Pinterest i found this granny square coat, which they both liked very much. I found the designer, Oma Koppa on Facebook, and she is an amazing artist! Her Facebook link is: https://www.facebook.com/506706346027000/photos/a.766161623414803.1073741834.506706346027000/776258732405092/?type=3&theater - please check her work! 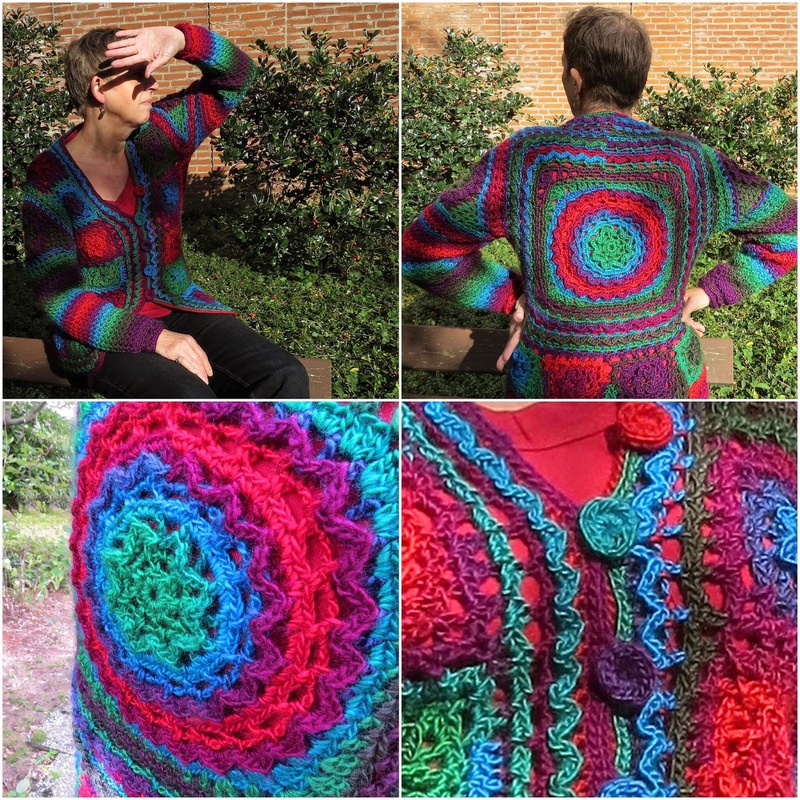 Being who i am, i didn't want to simply copy the pattern, but started looking for an alternative square. Soon enough i found a nice looking one, and crocheted it. 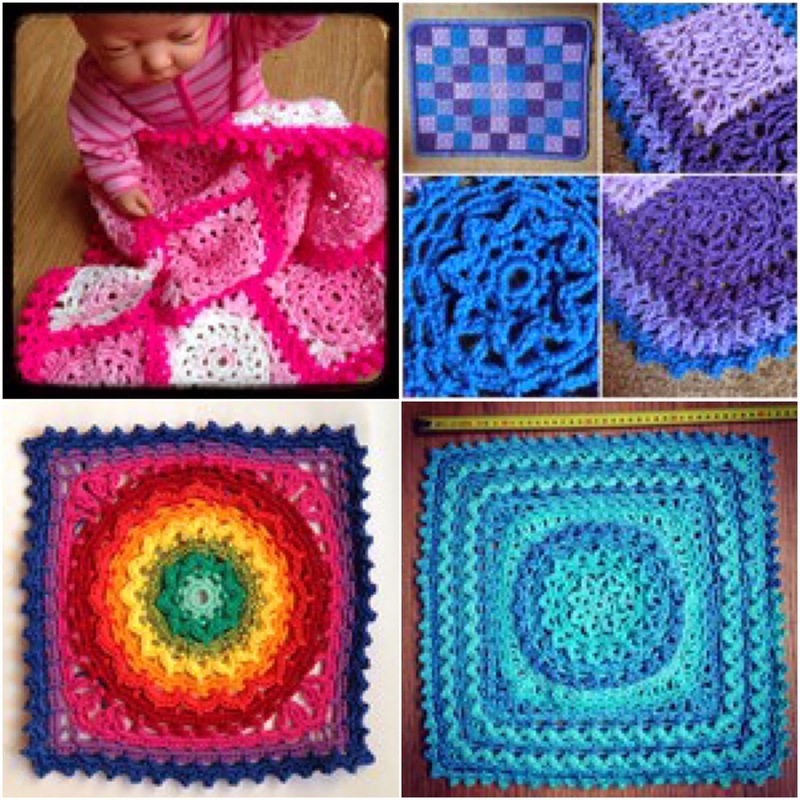 (Unfortunately i deleted the source of this square, so i can't give a link to that pattern) After making a couple of squares, i didn't like it enough, but used the rejected squares to make a blanket for the doll's bed. I started playing with the pattern, and designed a new one. I loved it, and we chose a color scheme in purples and blue. After making a bunch of squares, we didn't like the way it turned out. Again the rejected squares turned into a project, a baby blanket. I bought some cheap yarn, and started designing the actual cardigan. It's always better to make try-outs with cheap yarn, since there's a lot of ripping involved:) This went smoothly, the result was a form fitted cardigan in my size. The second try in order to see if the pattern was correct, made from a selfstriping yarn, turned out even more beautiful. Finally we reached the point of choosing the designated yarn. The choices of yarn are limited, because my daughter is allergic to wool. 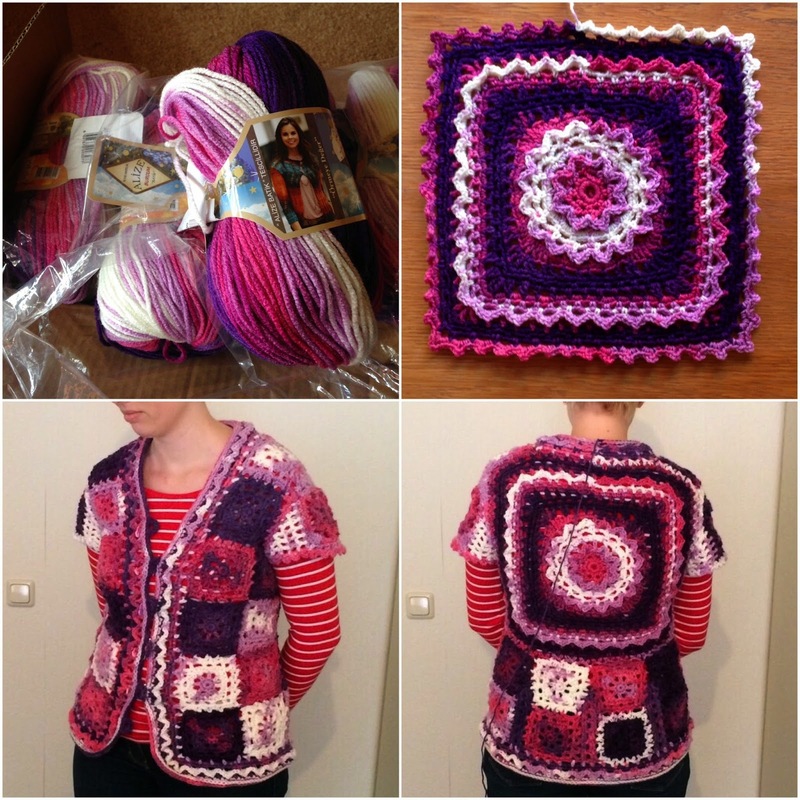 We went for acrylic yarn, Alize Burcum Batik bought at yarnstreet.com in selfstriping pink-purple-white. 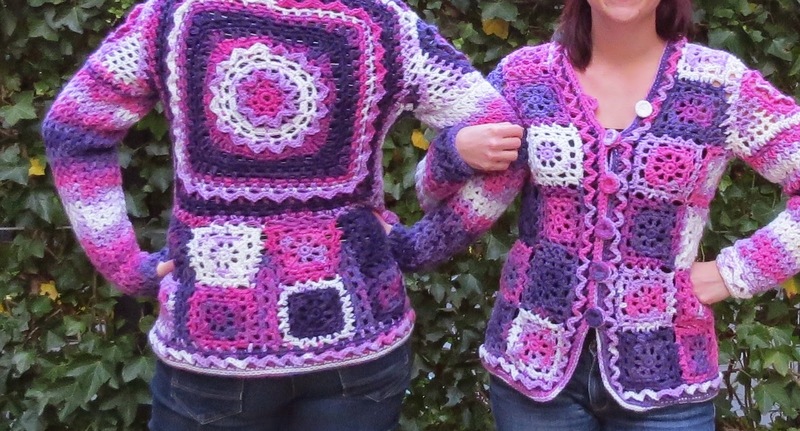 The present day... the cardigans are crocheted, fitted to their specific wishes, and all done! I am so proud of the results! It was a long journey, but i learned a lot along the way. For me, that's the merit of designing, testing and learning new things. 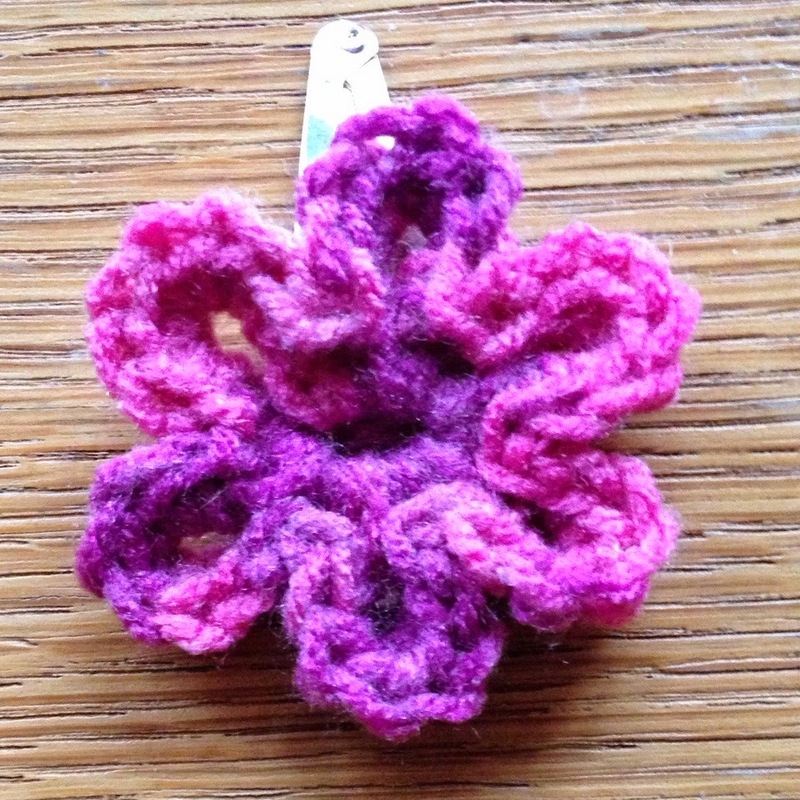 A little extra: a flower clip to match the cardigan. 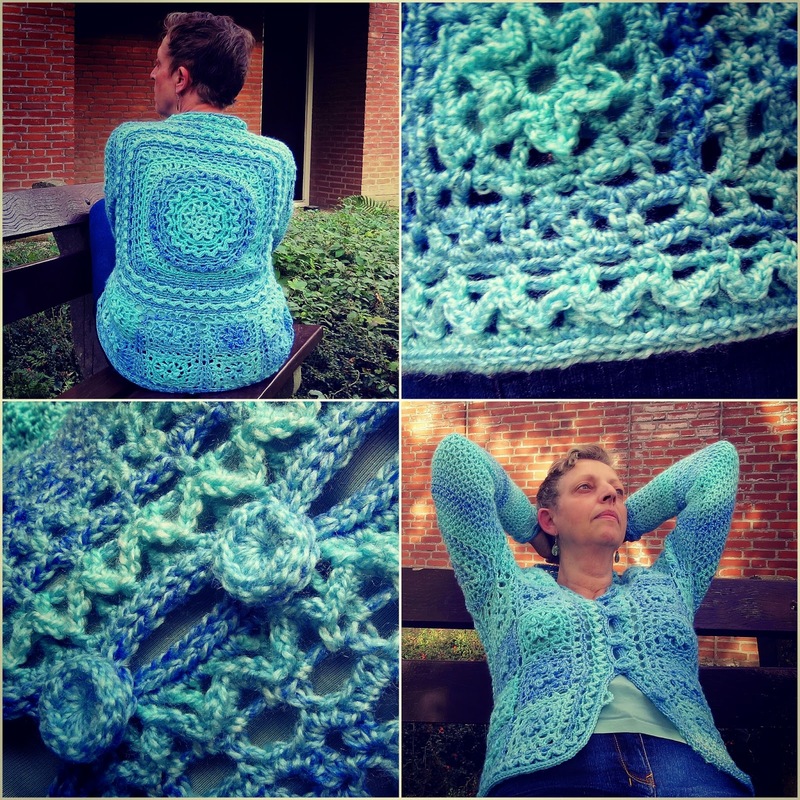 My other daughter has ordered such a cardigan as well, i still have to finish some ongoing projects, but this pattern for sure will return in my work! Is a very long road that you did but the end result is magnificent. You can be proud of this self-designed creations !!! Well done !! !